On April 2, Troop 50 bestowed the Boy Scouts of America’s highest rank during a ceremony honoring new Eagle Scout Ian Melkerson. The ceremony occurred at Auburn's First Presbyterian Church, where the troop meets weekly. Troop Committee Chair Rob Stanford served as the master of ceremonies. The troop's current senior patrol leader, Josh, called the court of honor to order with a presentation of the colors that included Troop 50 Scouts Nicky and Trey. Tyler, an Eagle Scout from Troop 29, offered an opening prayer. Next, as Ian lit red, white and blue candles, Mr. Stanford and Nicky read a narrative outlining the relevance of the Scout Law in our daily lives. Scoutmaster Andrew Baird then invited Eagle Scouts in attendance to join Ian in front of the audience for the Eagle Scout charge. The nine Eagle Scouts, including Mr. Baird, represented Ian's friends, fellow Scouts and Scouting leaders — and spanned five decades from the 1970s through 2010s. Eagle Scouts representing five decades stand with Ian for the Eagle Scout charge. Scout medal on his uniform. Ian's parents — John and Nancy — then presented him with the Eagle Scout insignia, which included his Eagle Scout medal, rank patch and neckerchief slide. He in return awarded his parents with Eagle Scout mother and father pins. After Ian's parents were seated, Michael Tullier, the troop's charter organization representative, joined Mr. Stanford to present to Ian membership in the National Eagle Scout Association (NESA), which the troop provides to each of its new Eagle Scouts. As the ceremony neared its conclusion, Ian expressed his appreciation to everyone who attend, as well as those who mentored him throughout his Scouting participation. He paid special tribute to two individuals who contributed greatly to the success of his Eagle Scout project: his Eagle Scout coach, Rob Stanford; and Rebecca Bresler, the Jule Collins Smith Museum's former K-12 education curator with whom he worked to complete his project to benefit the museum. Ian joined the Boy Scouts in 2011 as a member of Troop 29, where he served the troop as its webmaster. In 2016, he became a member of Troop 50, and since then has served the majority of that time as an instructor. Through his Scouting participation, he earned 42 merit badges; accrued 49 nights of camping; was elected as a member of the Order of the Arrow, the national Boy Scout honor society; and completed National Youth Leadership Training, a six-day course equipping Scouts with leadership skills and experience applicable to both Scouting and personal situations. 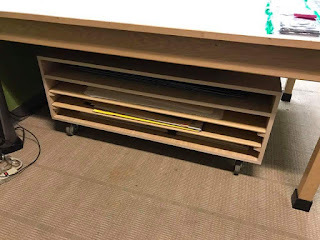 For his Eagle Scout leadership service project, Ian designed and constructed for the Jule Collins Smith Museum of Fine Art at Auburn University a wheeled paper sorter to store and sort the large-format papers and cutting boards used by the museum’s K-12 educational staff. His project accrued 150 volunteer hours from planning to completion, including the 60 hours he spent personally planning, leading and supervising the various stages of the project. Eagle Scout Board of Review. After completing the Eagle Scout rank requirements, which included planning and executing his service project, Ian appeared before the Saugahatchee District’s Eagle Scout Board on December 20, 2016. In addition to being the district's last Eagle Scout of 2016, he is among the four Troop 50 Scouts to earn his Eagle in 2016, and the 13 Scouts to earn the Eagle Scout rank since the troop’s founding in 2012. He is among the 55,186 Boy Scouts nationally who comprise the 2016 class of Eagle Scouts. Ian is the son of John and Nancy Melkerson of Auburn. He will graduate from Everest Academy this June. Currently, he plans to attend the University of West Alabama, where he intends to begin studies toward a technological-focused degree discipline on a Trustee Scholarship for academics and leadership. For more photos from Ian's Eagle Scout Court of Honor, visit the troop's online photo album.